This statistic shows the revenues of the U.S. government in the fiscal year of 2018. 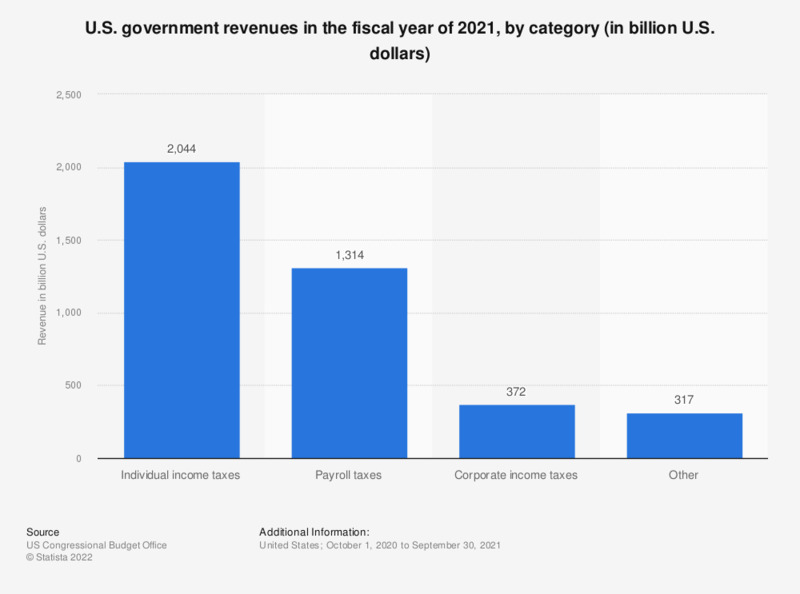 The total revenues received sum up to about 3.33 trillion U.S. dollars and consist of individual and corporate income taxes, payroll taxes and other* taxes. Individual income taxes totaled up to 1.68 trillion U.S. dollars in 2018, which is approximately 8.3 percent of GDP, whereas corporate income taxes totaled to 205 billion U.S. dollars, about one percent of GDP. * Other revenues are: excise taxes, estate and gift taxes, customs duties, and miscellaneous receipts. Social insurance taxes are payroll taxes that fund social insurance, primarily social security and Medicare's hospital insurance program.